Studio Apartments are usually considered to have a single space comprising the living, dining, kitchen & bedroom! Some would call it claustrophobic rather than a self-contained efficient apartment. The notion of a tiny house has lately become popular with the students and young working professionals as well as the older generation. Efficiently planned spaces with easy maintenance provide for more time in todays fast moving lifestyle. 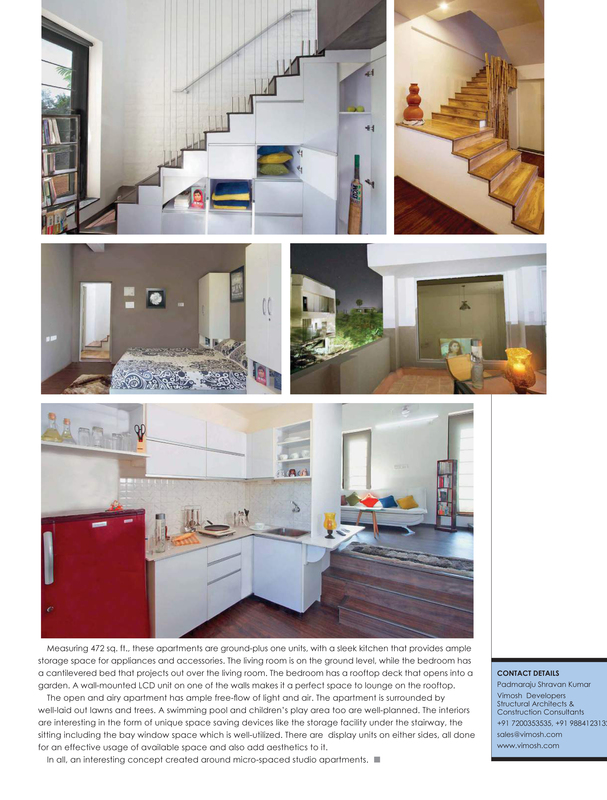 The idea of a studio apartment has been taken up a notch at the Micro Villas coming up in Chennai. Located along the scenic East Coast Road, the ‘micros’ allow serene surroundings while being in close proximity to the capital city of Chennai. The concept for this studio apartment hinges on the relationship between three intersecting volumes and a base. The primary volume consists of the double height living area that bisects the house and contains the vertical circulation, acting as a light well. The living room opens outside to a small private garden space. Two secondary volumes are inserted to focus views and highlight significant programmatic elements. The kitchen and bathroom are combined into a singular volume at the entrance of the house. The third double height volume includes the bedroom, visually isolated from rest of the apartment. The roof deck, accessible from the bedroom, is comprised of a larger viewing platform. The material palette reflects light, creating an illusion of a larger space. Dark Oak wooden floors hover over rift white walls and cabinets. Bright fabric colours add variety to the space. Previous Previous post: VASTU – a term misunderstood.